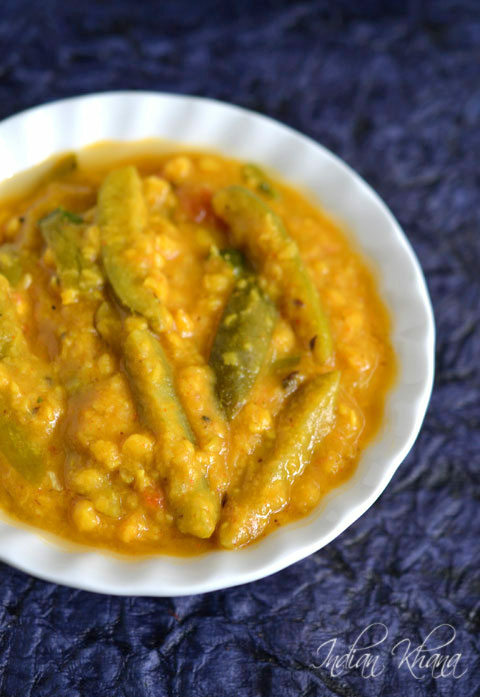 I have already posted tindora dal recipe and in that I have used yellow moong dal and made it in little different method, you can try that version too and today I am sharing one of the method which I do the most. Tindora and chana combo works really well and this recipe is no onion no garlic so for people whom doesn't eat onion, garlic it's good for them. 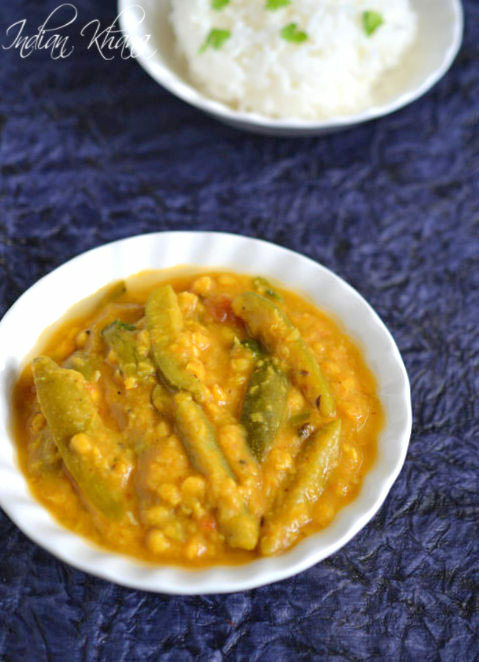 You can also make this dal for lunch box. You can check other Tindora Recipes here. 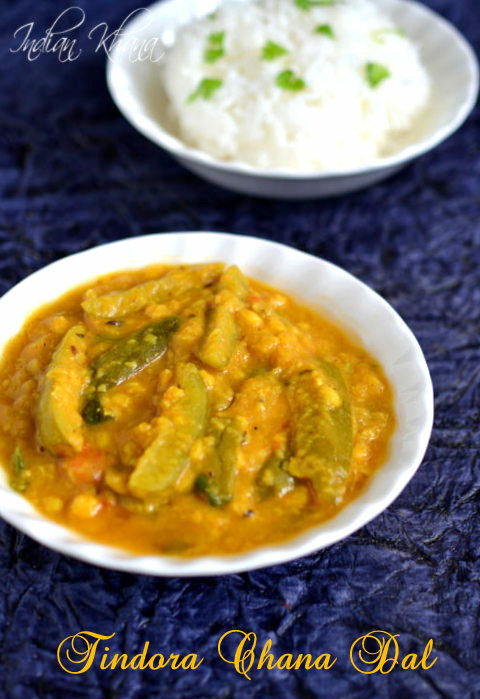 Quick, healthy dal with goodness of tindora (Ivy gourd). Wash and soak dal for 10 minutes and meanwhile cut both ends of tinora/ivy gourd and cut in 4 pieces or small pieces if perferred. Chop tomato, coriander leaves and slit green chilies. Pressure cook dal with tindora, turmeric powder for 4-5 whistles, once pressure released open cooker. In a pan or wok heat oil add hing, bay leaf, cumin seeds and allow to splutter. Add ginger, green chilies and saute until light brown, now add tomato mix well, cover and cook in slow to medium flame until tomato gets mashed fully. Add red chili powder, garam masala mix well and cook for a min, add cooked dal with tindora, salt and 1/2 to 1 cup water bring it good boil, simmer for 2-3 minutes. Garnish with coriander leaves and off flame. Serve hot, warm with steamed rice/roti/paratha. Instead of ginger you can add garlic. You can cut tindora in roundels or medium size pieces too. This dal is normally thick as you see in pictures, if you want you can add more water to dilute dal. 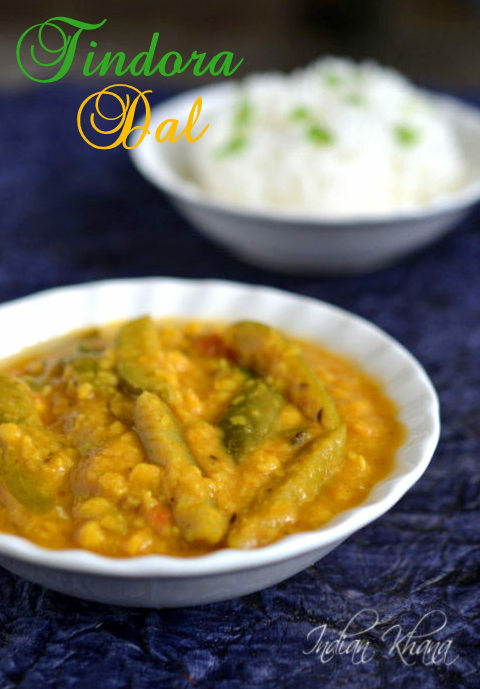 This dal goes well with rice and roti, paratha too.